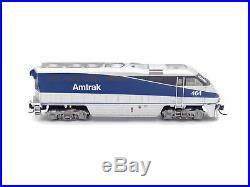 Amtrak West F59PHI Locomotive #455 w/ Sound & DCC N - Athearn #ATH06780. Brand new in jewel case. # on item may vary from the one shown in photos. Fully-assembled and ready-to-run out of the box. Non-sound locomotives are DCC ready. Highly detailed, injection molded body. Bi-directional constant lighting so headlight brightness remains consistent. All-wheel drive with precision gears for smooth and quiet operation. Heavy die-cast frame for greater traction and more pulling power. 5-pole skew wound motor with weighted and balanced flywheels. Multi-link drive train for trouble free operation. Clear plastic jewel box for convenient storage. Operates on Code 55 and 80 rail. Onboard DCC decoder with SoundTraxx Tsunami decoder. Sound units operate in both DC and DCC. Some functions are limited in DC. Engine, horn, and bell sounds work in DC. All functions NMRA compatible in DCC mode. Program a multiple unit (MU) lashup with lead unity only horn, bell, and lights. Many functions can be altered via Configuration Value (CV) changes. CV chart included in the box. This promotional offer does not apply to all items. The following set of condition guidelines will provide you with a general idea as to the severity of defects of the item, as well as the amount of defects to be expected. Each and all defects pertaining to the item will be noted within the description as usual, in addition as to whether or not the broken pieces are included. These will be items that are NIB with no defects of any kind on the item itself, but have shop-worn packaging such as slightly damaged corners on the box, faded colors, or yellowing of the window-packaging. 2nds marked with this condition will have a maximum of (1) defect, and they will be that of a very mild issue. These defects could include, but are not limited to: wavy roofwalk, loose weight, printing typo, broken grab iron, broken air hose, etc. 2nds marked with condition C-5 will have a maximum of (2) defects, and these defects would include: broken grab irons / airhoses, warped / bent ladders, a minor paint / lettering issue, broken / missing stirrups. Any 2nds marked in C-4 condition indicate an item that has (4) or more defects with the item, and this would constitute cars that have all the ladders, air tanks, grab irons and/or additional pieces missing from an entire end or more, or even an entire truck assembly absent. This condition would indicate an item that has incurred severe damage, with (5) or more defects, and is good for parts only. 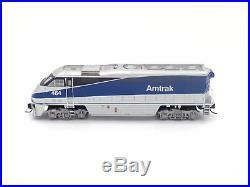 The item "Amtrak West F59PHI Locomotive #455 with Sound & DCC N Athearn #ATH06780" is in sale since Monday, June 11, 2018. This item is in the category "Toys & Hobbies\Model Railroads & Trains\N Scale\Locomotives". The seller is "vmf121" and is located in Blissfield, Michigan.